While curved OLED TVs may be little more than an expensive distraction, Ultra HD is the future and the future is… now. Samsung has just released its first Ultra HD TV in the shape of the Samsung UE55F9000 and it's been one of the most delicious treats of the year. 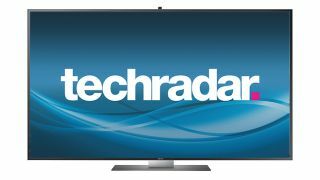 A brilliant all-rounder, offering superb picture quality, smart tv features and all sorts. It's IFA 2013 next week which means we'll be seeing roughly 64 trillion 4K pixel-packing panels announced by the likes of Philips, Panasonic and many other manufacturers that don't begin with P. And the good news is that some of them might even be in the price range of us mere mortals, so keep your eyes peeled to TechRadar next week. Yep, Samsung's UE55F9000 is another simply spectacular Ultra HD TV that also happens to bring the high-resolution technology in at more manageable price and size levels than any previous 4K model. Its slender design delivers an attractive alternative to the bigger look of Sony's 4K TVs, and its smart TV service is unmatched in terms of the video streaming content on offer. The Samsung UE55F9000 isn't necessarily better than Sony's X9005A 4K models, but it's certainly just as good, simply offering a surprisingly different approach to the undoubted joys of UHD. The Samsung Galaxy S4 Active finds itself a little in no mans land, and it's a difficult one for us to recommend outright. If you're in the market for a super powerful smartphone which you can take on extreme activities, swimming and in the bath then sure the Galaxy S4 Active is the best around, but that's a pretty limited market. When it comes to the best high-end smartphone around there are a number which trump the S4 Active in terms of style, portability and features and if you're shelling out a lot of money surely you want the best? So if you're in the market for a top end smartphone then we'd say it's worth taking a look at the Samsung Galaxy S4, HTC One, Sony Xperia Z and even the Nokia Lumia 925 or iPhone 5, but if you fancy something a little different then you won't be disappointed with the Galaxy S4 Active. The Panasonic GX7 is a very nicely constructed camera that should meet the needs of experienced photographers looking for a small camera that accepts interchangeable lenses and enables plenty of control. It's a good alternative to a DSLR. It's designed to be more compact and more portable than Panasonic's mini-DSLR style G-series cameras, but it still provides an impressive range of features. Our only disappointment is that the screen is tilting rather than fully articulating to make it more useful when shooting upright images. Panasonic has managed to produce a contrast detection AF system that is getting close to a good phase detection system in a DSLR. It is to be congratulated for pushing the boundaries of what can be done with a compact system camera, and for making them more versatile. Philips' top Full HD television for 2013 - with the exception of the larger Philips 55PFL8008S, perhaps - is one of the best in the business. Detail in both moving images and close-ups is excellent, blacks are profound and its Perfect Natural Motion circuitry adds an enjoyable high frame rate-look. Ambilight impresses once again, while the floating design is incredibly effective. Its double-sided remote makes entering text on a TV at least a possibility, while the sound quality is nothing short of stunning.